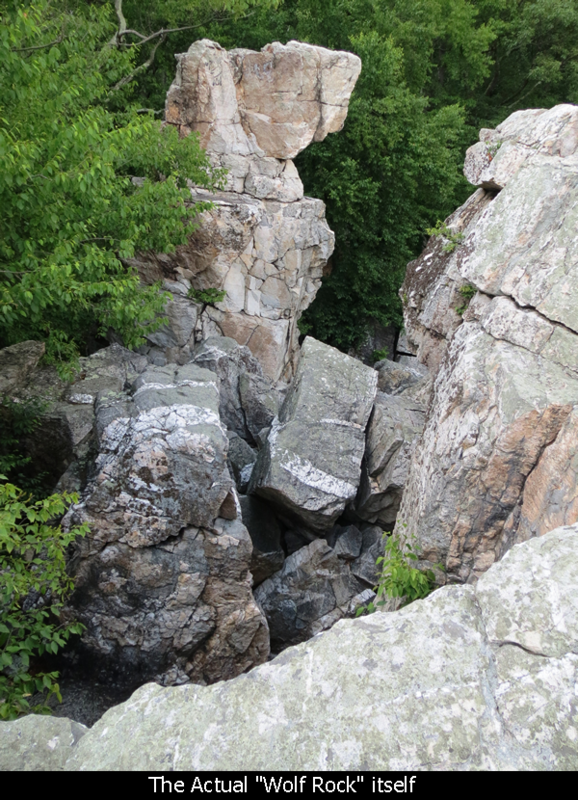 The Catoctin Mountain and Cunningham Falls area near Thurmont, MD has lots of great hikes. You can combine various trails for any level of strenuousness you are looking for! The two parks are adjacent to each other. Cunninham Falls is a Maryland State Park, and Catoctin Mountain is a National Park. Cunningham Falls not only has the Falls itself and miles of trails, but also has a nice lake where there is a beach and paddle boating in the summer. 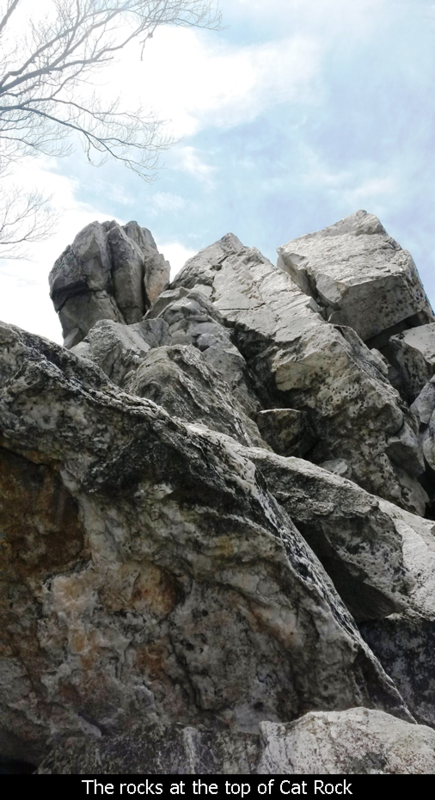 Catoctin Mountain Park is mainly trails with some neat overlooks and rock features. Catoctin Mountain Park has a nice little Visitors Center with bathrooms and friendly Rangers to help you get your trail plans together. 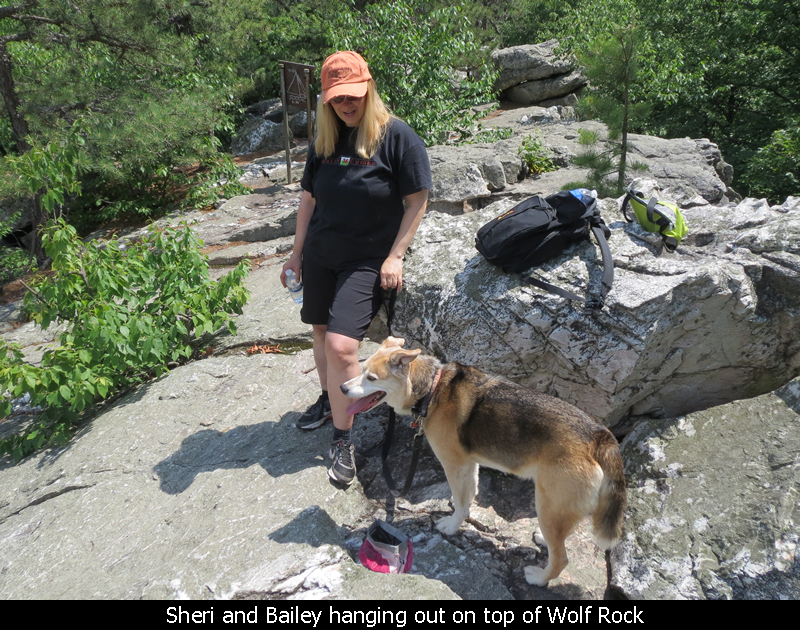 As we live near there, we go there all the time to hike and have done most of the trails. So, I'll describe a few of our favorites. 3 Mile - Easy - Cunningham Falls from Catoctin Mountain Visitors Center - This hike is about 3 miles round trip and starts at the Catoctin Mountain Park Visitors Center (across the road in the auxiliary parking lot). Just follow the sign and stay on the gently rolling trail until you reach the intersection at Rt. 77. You will have to cross the road to see the Falls, but walk on a nice wooden pathway and it leads you right there! The nice part about taking this route is that you don't have to pay the entrance fee to Cunningham Falls Park, which you would if you drove directly into the park. 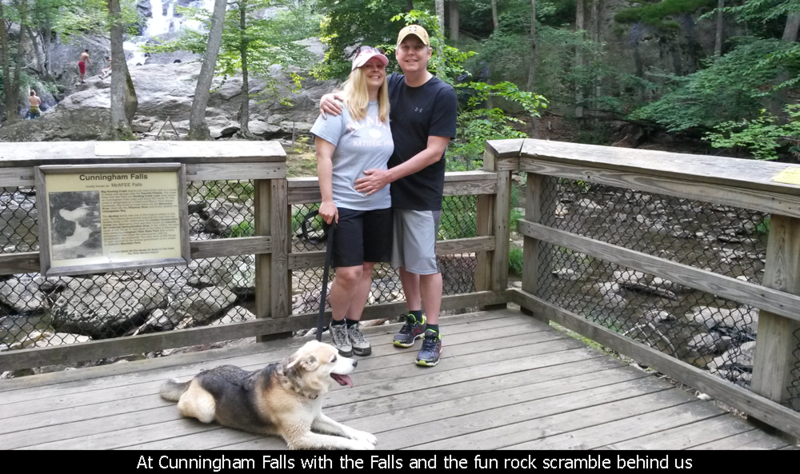 Also, in the summer, you can't bring a dog through the gate at Cunningham Falls Park. 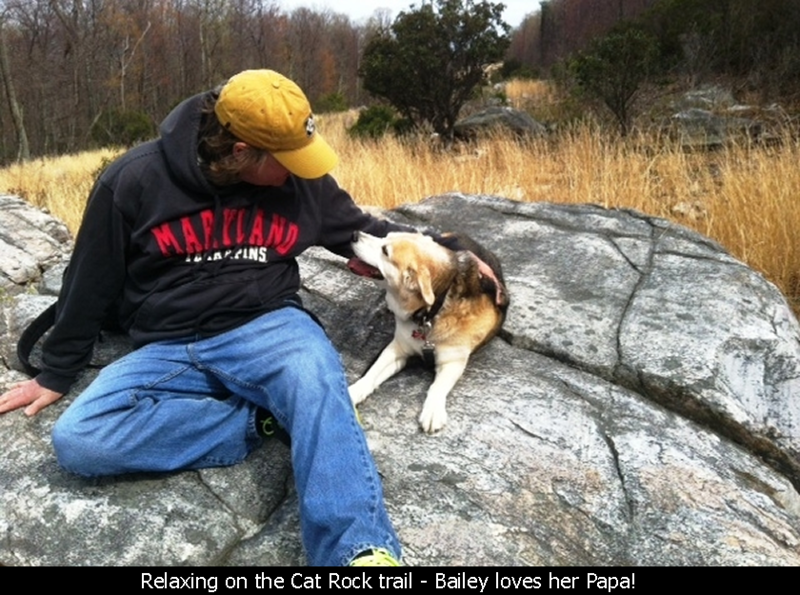 But if you walk in from Catoctin Mountain, then Fido (or Bailey in our case) can come! 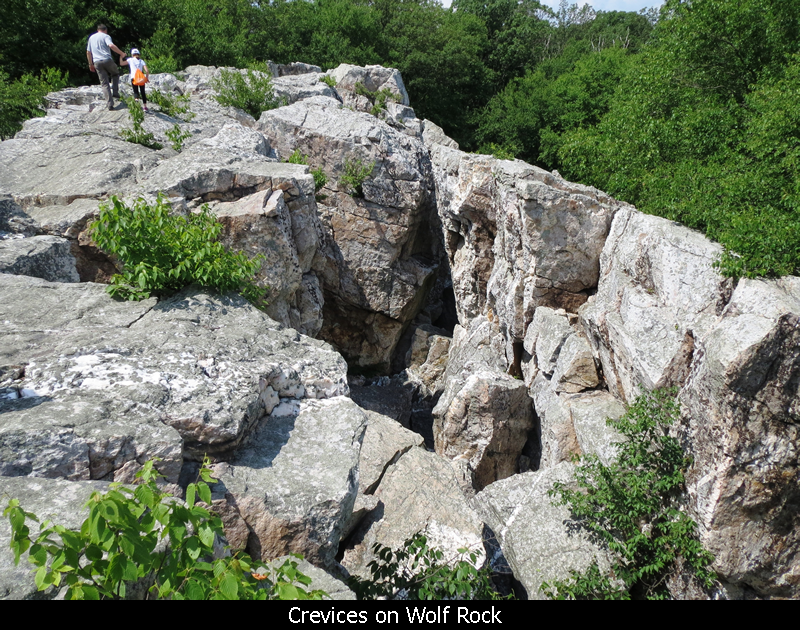 This is a great hike for if you have varied skill sets, family type outings, or just an easy 'get some fresh air' hike. 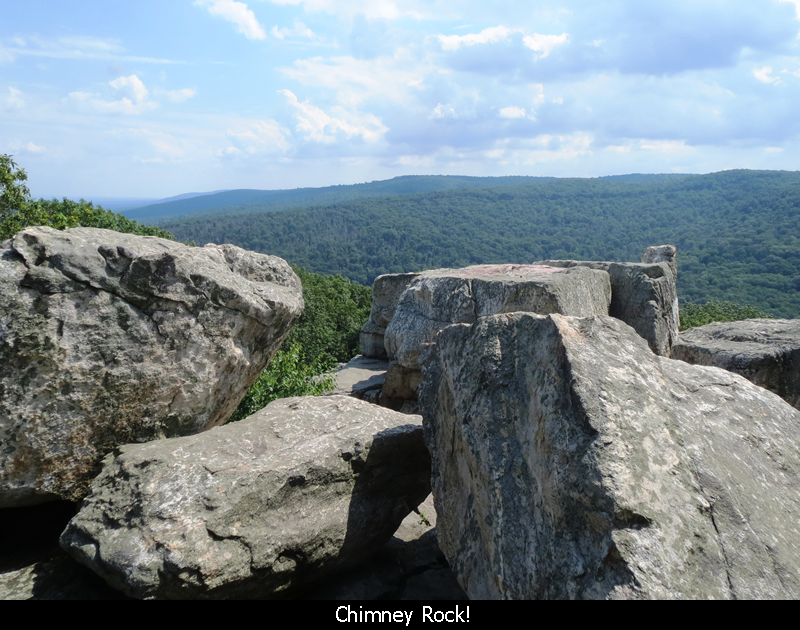 7.8 Mile - Catoctin Mountain Loop - Taking this loop the clockwise way, begin at the Catoctin Mountain Visitors Center. Take the trail towards Cunningham Falls as described in the above hike. At the intersection by Rt. 77, take a right towards Hog Rock. This trail will be an uphill stretch for 1.5 miles through some nice terrain. 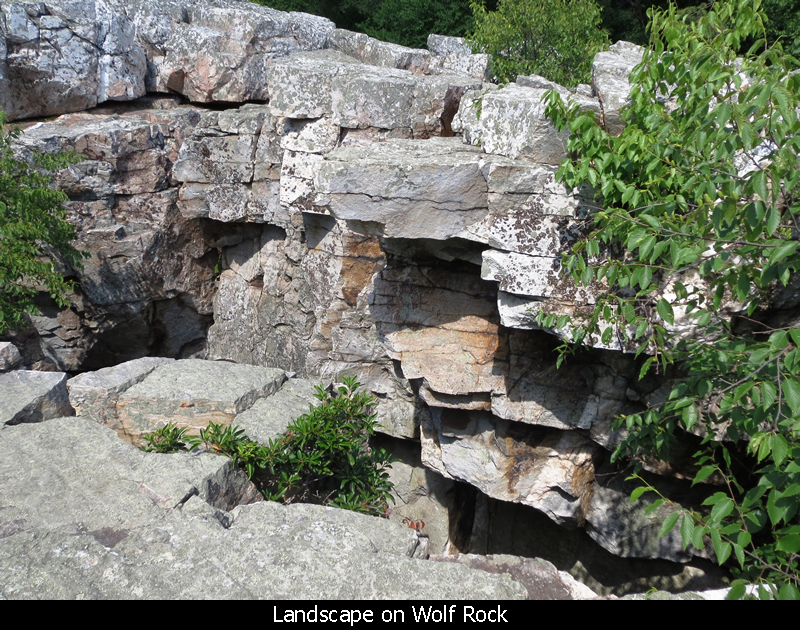 There are a couple of nice rock outcroppings you travel through eventually to get to the Hog Rock overlook. 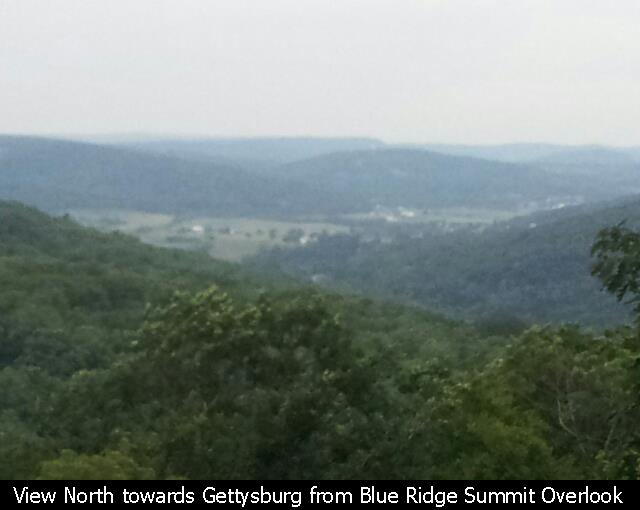 Just pass the Hog Rock overlook, you will cross the Catoctin Mountain Road at a parking lot. Continue on the trail to the Blue Ridge overlook. Continue the loop towards Thurmont Vista. The trail will wind down and through a wet, almost rain-forest-like area then back up. Take a left at the trail marked towards Thurmont Vista. 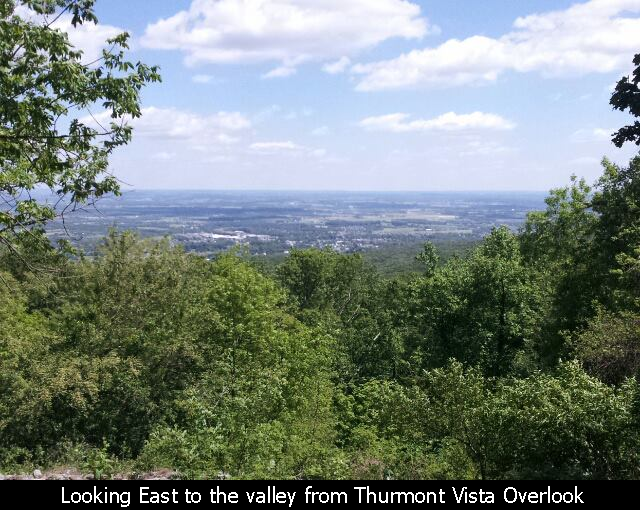 Another half-mile will take you to Thurmont Vista where you can see out to the Valley to the East. 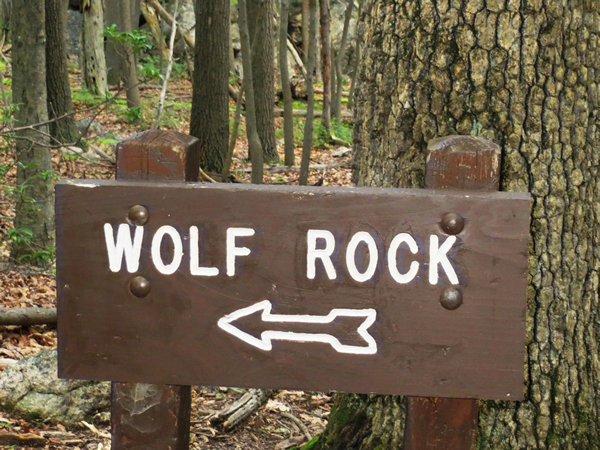 Continue on from Thurmont Vista and in another 1.5 miles reach Wolf Rock. 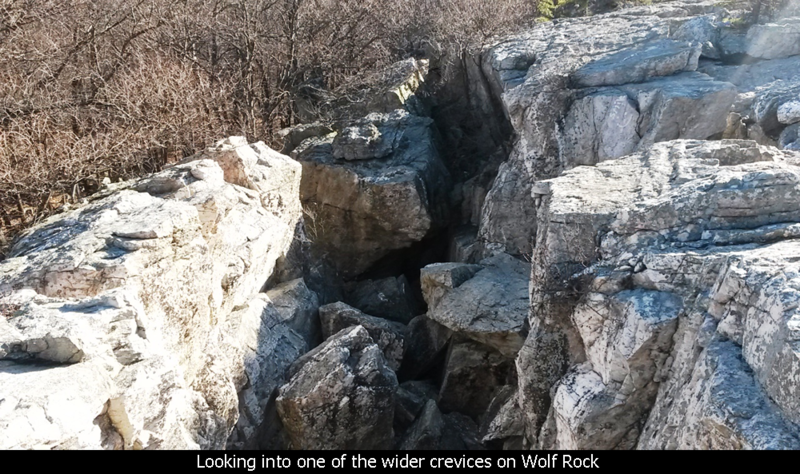 If you like rock scrambling, you will love Wolf Rock. 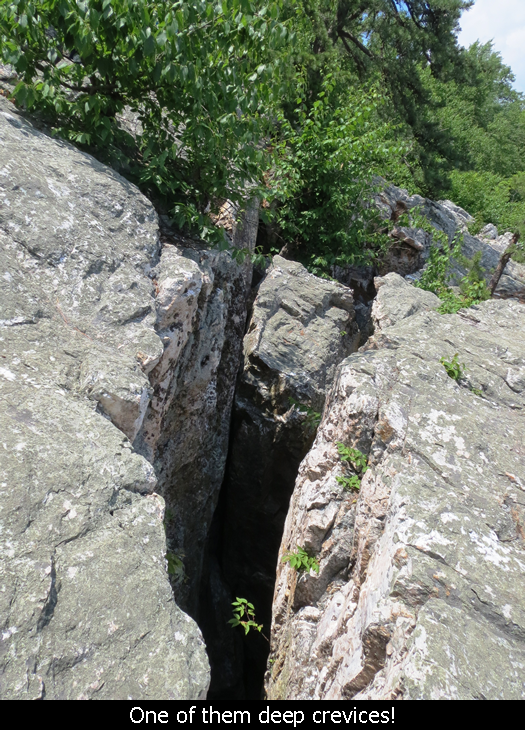 It doesn't have an overlook, but instead is a maze of crevices between an elevated rock formation. 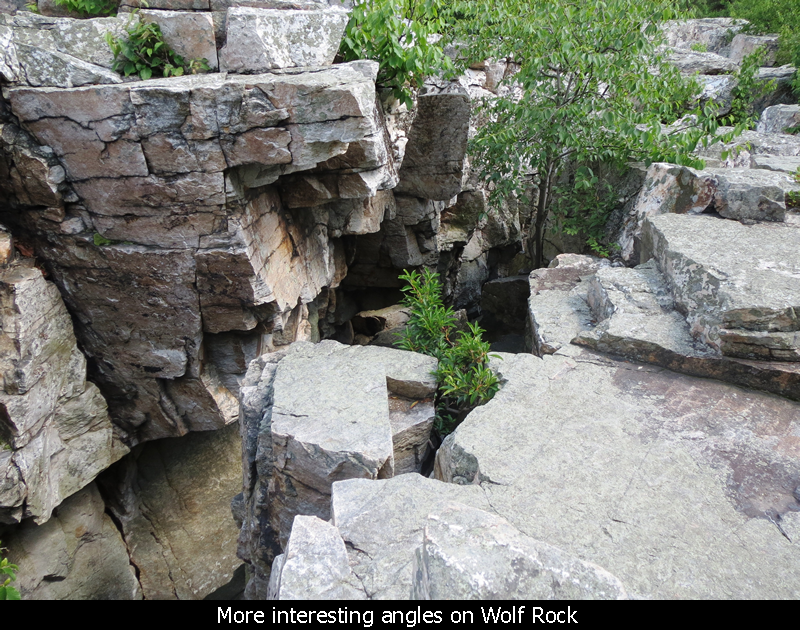 There is lots of jumping from rock to rock, and climbers use this location too. But be careful!! 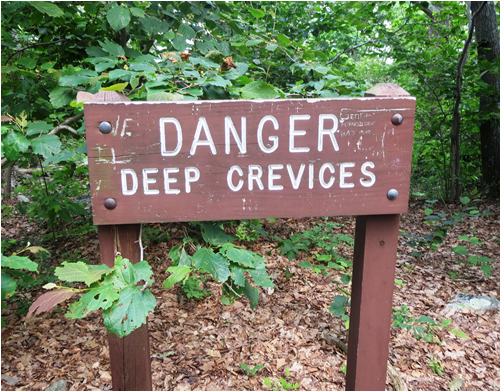 You can really get hurt or even die if you fall into one of these crevices!! Continue on the trail another 3/4 mile to Chimney Rock, which is the best overlook in both parks. 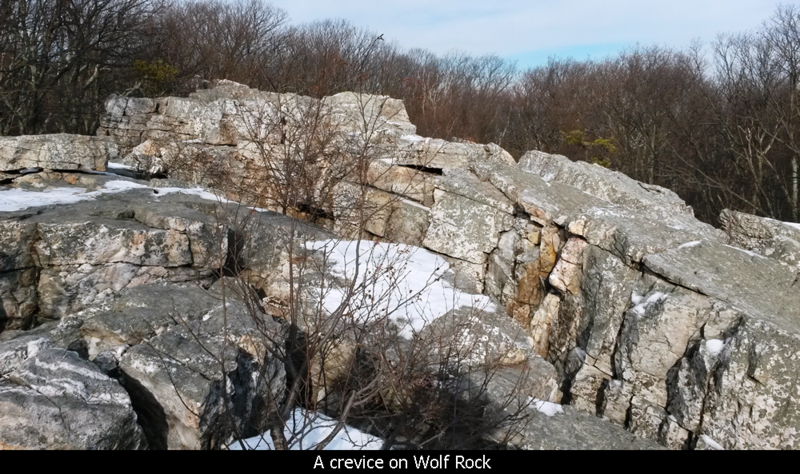 There are some rock scrambles and crevices there too (but nothing like Wolf Rock) but the overlook itself is really cool and looks to the Southeast. After Chimney Rock, you will wind around and down to the Park Headquarters. From there pick up the moderate trail towards the Visitors Center to finish the hike! 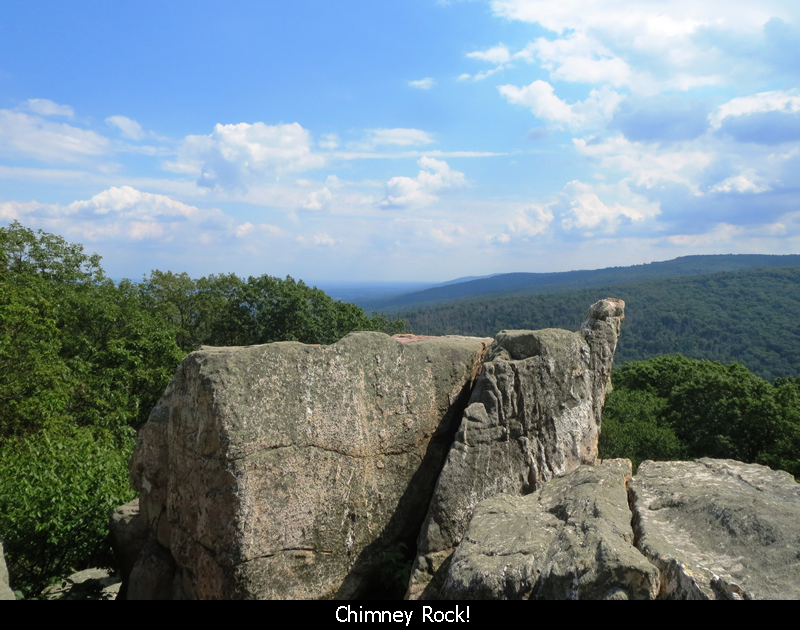 5 Mile - Cat Rock and Old Misery Trails - For this hike you can either park across the road from the Catoctin Mountain Park Headquarters. 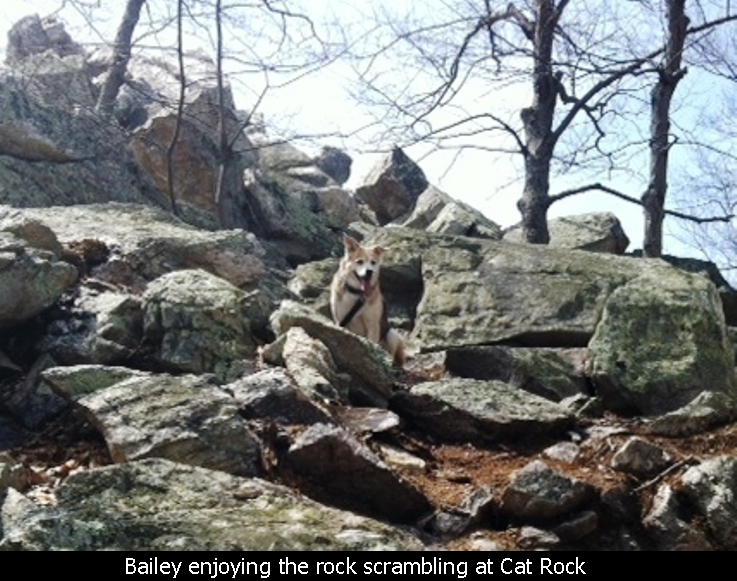 This puts you onto the Cat Rock trailhead. 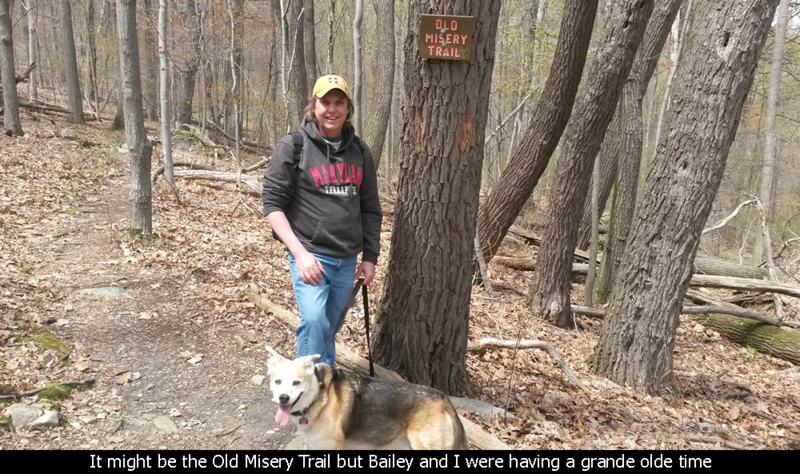 Alternatively you can park at the Old Misery Trail trailhead. Both of these trail begin by going up and they meet 1/4 mile below the Cat Rock overlook. 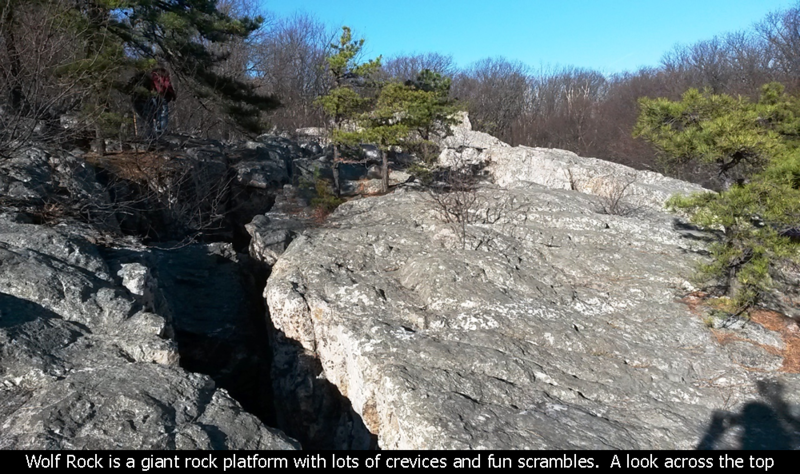 Continue up towards Cat Rock which has a few nice rock scrambles and a decent overlook. Continue back down the opposite trail. Then returning will send you back up! 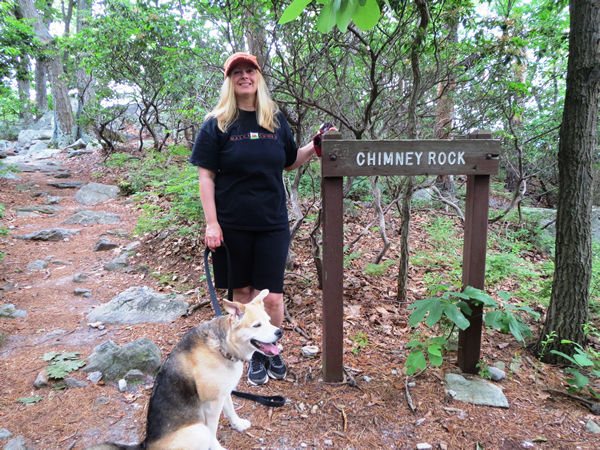 A nice 7 mile variation of this hike to give yourself lots of elevation gain is to start at the Old Misery Trail trail head... to down the Cat Rock trail, cross the road to Catoctin Mountain Park and go up (to the right) to Chimney Rock. 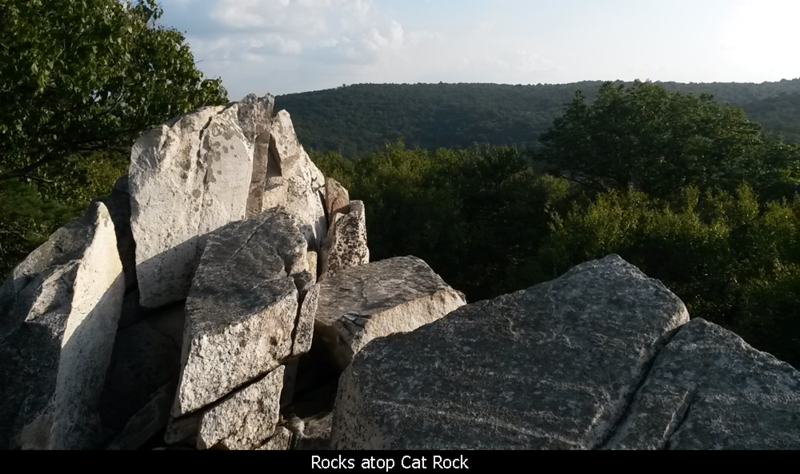 Then go back down to the Cat Rock trailhead, and up (and visit Cat Rock) and then down the Old Misery Trail. Another variation of this hike would be to just go straight towards Cat Rock (from either the Cat Rock trailhead or the Old Misery Trail trailhead and then continue the ridge trail over to the Bob's Hill area. 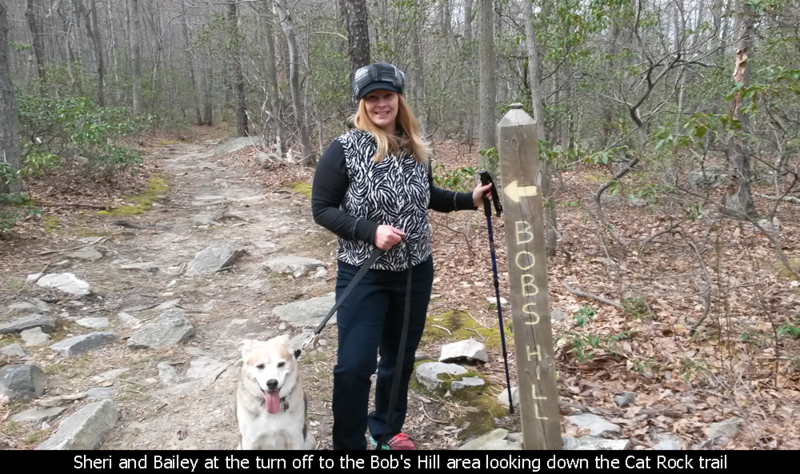 3.6 - Mile Bob's Hill Hike - There are two areas to park in Cunningham Falls Park. 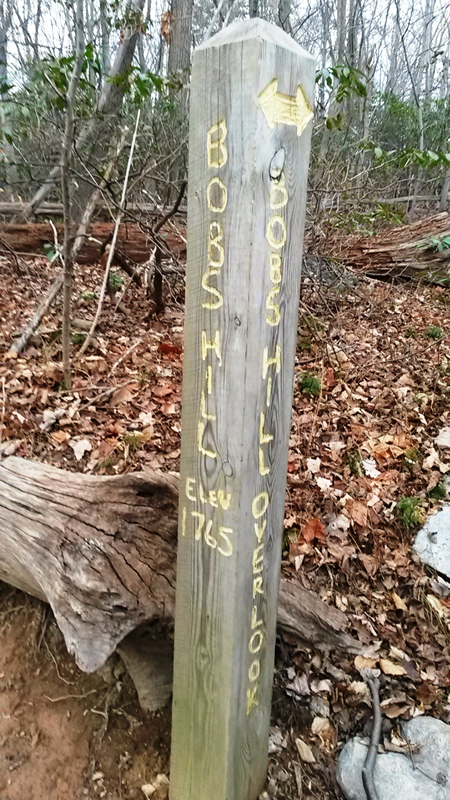 For the Bob's Hill hike, park at the Manor Parking area which is just off Route 15 as you approach Thurmont from the South. There is a 3 dollar entrance fee. Veer to the left once inside the parking area and the Bob's Hill trail is off to the right. It is straight up 1000 vertical feet and 1.8 miles! Definitely a strenuous climb as it is the longest hill in both parks. Once you reach the top, there are two overlooks. The left overlook (on the Southern side) is the best. 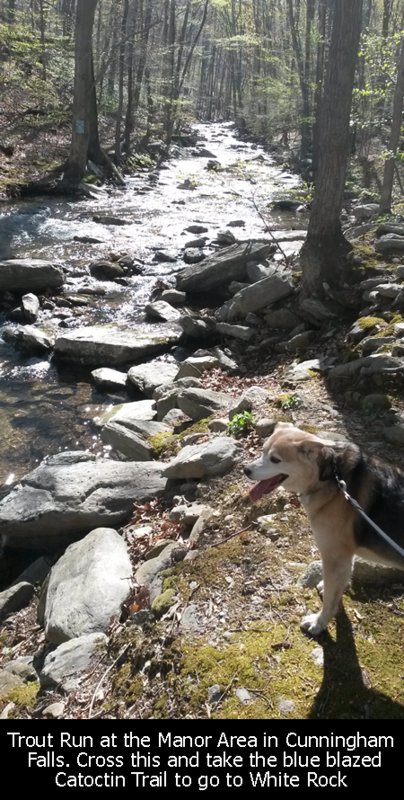 There are also some additional wildlife trails in Catoctin Mountain Park, and the there is the main (but short) Cunningham Falls trail. 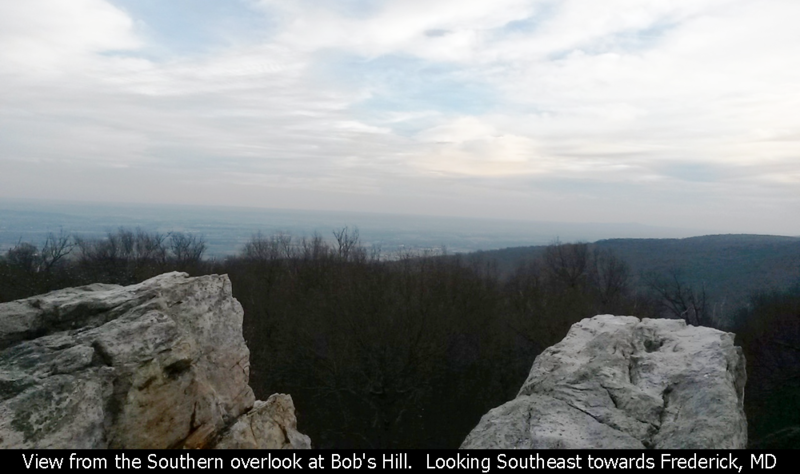 Additionally, the Catoctin Mountain trail cuts through both parks (and cover the Bob's Hill hike described above). 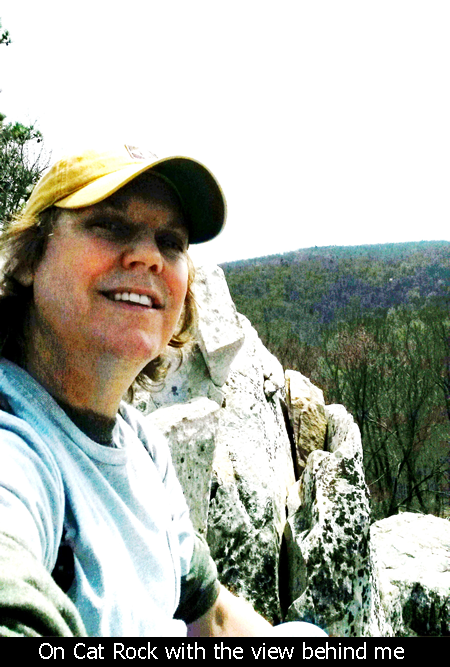 Another very nice hike is from the Manor area, cross Trout Run, and head south on the Catoctin Mountain (blue blazed trail) to the White Rocks overlook. Get a good map and there are miles and miles of trails just in this area. One word of caution though... Watch out for the Rattlesnakes!! 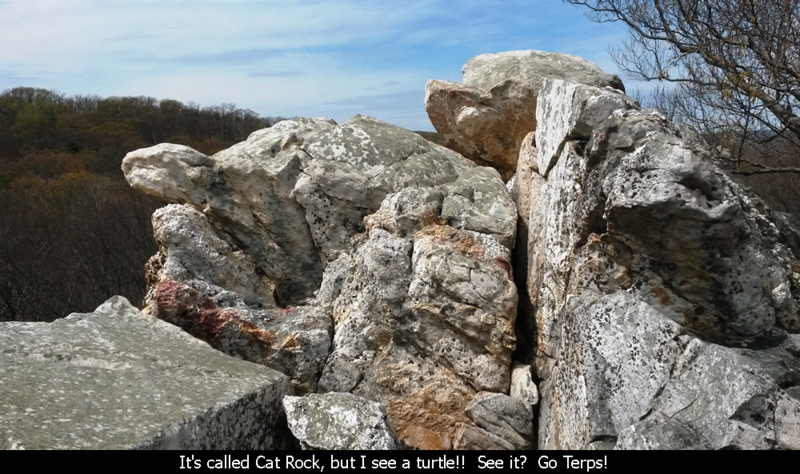 This is one of the last places in the State of Maryland where Timber Rattlers reside and they love to hang out at rocky areas like the overlooks. One day we saw two of them on the Bob's Hill hike. These snakes don't make a rattling sound like you see on TV from Western rattlsnakes. Instead it is much more of a hissing sound, like letting the air out of a tire. There are also copperhead snakes in the area. But apparently the bite from the Timber Rattler is the worst. Trailheads from Catoctin Mountain Visitors Center (Cunningham Falls Hike and Catoctin Mountian Loop): Take Route 15 to MD77W. Go one mile past the Catoctin Mountain Park Headquarters and the Catoctin Mountain Visitors Center will be on the right. Park in the main lot or the auxiliary lot. 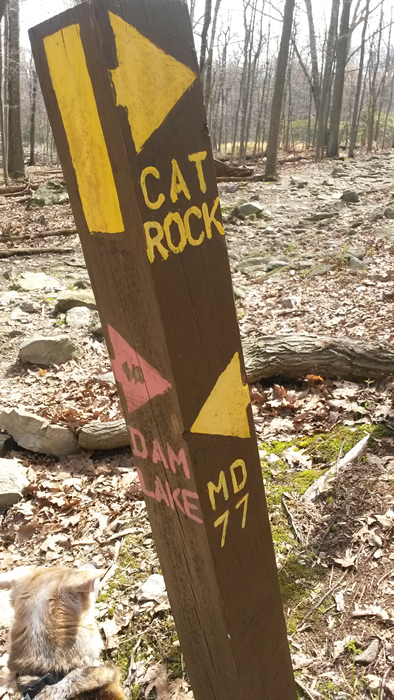 Cat Rock Trailhead: Take Route 15 to MD77W. Parking lot is across the road from the Catoctin Mountain Park Headquarters. 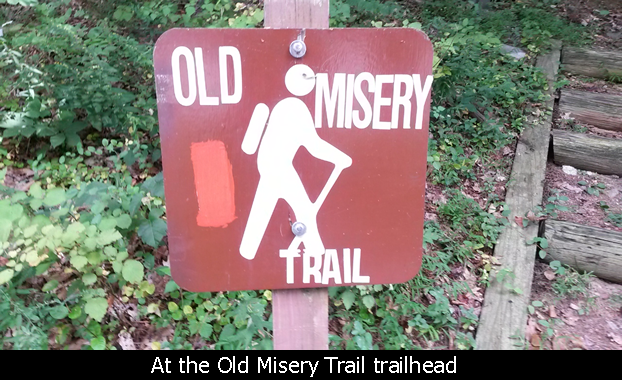 Old Misery Trail Trailhead: Take route 15 to Route 77W. Pass the Catoctin Mountain Headquarters and Visitor Center and go left on Catoctin Hollow Road. Parking lot will be on the right. Cunningham Falls William Houck Area: Cunningham Falls regular trails and Hunting Creek Lake - Take Route 15 to Route77W. Go left on Catoctin Hollow Road and then right on William Houck Dr.
Hope this has been enjoyable and / or helpful to anyone reading it!! Comment: Thanks for sharing these amazingly beautiful pictures! Comments ReCaptcha (to verify you are actually a person) Please click the ReCaptcha button below. Sorry to do this but we had robots posting spam messages on this blog and this prevents that.